"Remember that trip when we were lost?" M asked me. "What? We've never been lost!" I replied. "Yes we were," she said. "And we couldn't find that lake." "Oh, you mean Grouse Lake. We weren't lost. The lake was," I clarified. To be very clear, we have never been lost on a hiking trip, at least by my definition. My definition of "lost" is not knowing where you are, and not knowing how to get home. By that definition I have never been lost--not even when I was six and became separated from my family in a huge department store in an unknown city. I simply went to the door we used to enter the store and waited. I knew they'd be back through that door, and I'd meet them there. I wasn't worried. They apparently were. But there are certainly other definitions. And by those, we have wandered at times. >> We have not known exactly where we were. In fact, on one memorable occasion, we didn't find out until we came home and posted photos. >> We have not found what we were looking for, even though we were clearly very close to it--sometimes within 100 yards, as it turned out later. >> We once hiked to Heart Lake near Lassen National Park. There is no trail, and the topo map showed lots of logging roads. But the area had been logged after the topo maps were printed, and so the roads were completely different. We never did find the lake. But we will next time. >> We once hiked to Tangle Blue Lake in the Trinity Alps, following directions from a local, who had only ridden horses there, and told us about a short-cut that by-passed the first few miles of the trail. After a couple of delightful (more or less) hours wandering through alders and manzanita, we gave up. She later told us that she had forgotten one key point in those short-cut directions...! >> We've hiked through the forest out of Tuolumne Meadows towards Mariolumne and Mendicott Domes, only to find ourselves at the foot of Fairview Dome. >> We once hiked up from Fremont Lake to Cinko Lake, by-passing Chain of Lakes to hike up Walker Meadow....because we never did see the trail to Chain of Lakes. 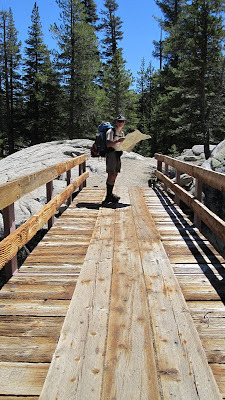 >> We once hiked DOWN the East Fork of the Carson River to Murray Canyon because we cold not find the trail that hiked UP the Carson River to connect to the PCT. We later learned that trail had not been maintained for nearly forty years, according to the ranger. >> We once hiked around the west end of Milk Run Meadow for an hour and a half because we could not find the trail that leads up to Peep Sight Peak. >> We once hiked cross country over snow covered creeks and up near vertical slopes because we could not find the trail to Broke-Off Mountain in Lassen. We did get to the top. We got back. But not via the trail. >> And yes, we once hiked across the southern part of Yosemite National Park towards Grouse Lake, where we were going to camp the first night. We could not find it. P was quite frustrated, and finally hiked down into a little valley to see if he could find a trail up to the lake. After staring up the valley for a good five minutes, he turned around to find the lake in plain sight behind him. But we've never been lost.